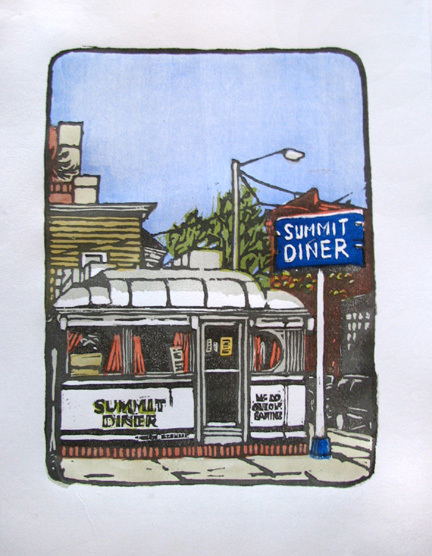 This is a woodblock print I made of the historic Summit Diner. I carved 7 different blocks of wood for the various colors and printed them Japanese style with pigment and rice paste. This process results in glowing colors. The paper is Japanese traditional handmade paper that is strong enough to take all the burnishing for all the colors. Instead of using an etching press, I used a special tool, a baren, to create the pressure. My Japanese baren has many ball bearings to create strong pressure that doesn’t damage the paper.